I have added Model Listener to track the changes in my model. I want to rebuild the project whenever a new node is added to my model. 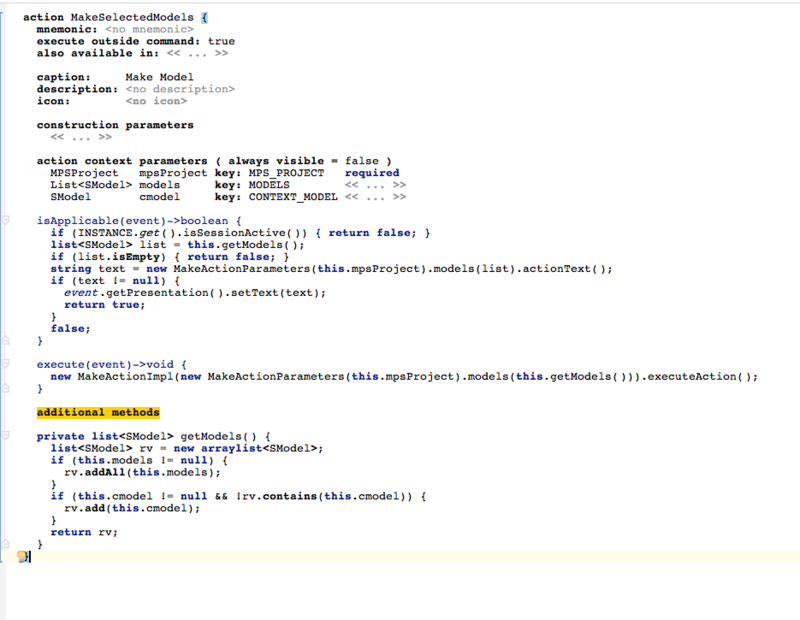 I have SModel which is from open api. Is there any way to call Rebuild Project from the code. You can do it the same way it's done in MakeSelectedModels or RebuildProject actions. The only problem that can appear here is that you can't know project from a model. You should somehow remember it in the listener. but I couldn't access my project within my plugin. I couldn't find project in "action context parameters" of my plugin. All I can get is my model. The declaration of the "project" parameter is in the jetbrains.mps.ide.actions@java_stub model, so you should import it and you'll see project among action parameters. That's quite undiscoverable, we plan to change this soon. I have one more problem. In my plugin, I want to use rebuild command in a loop. Every time I make few changes in the model and then I rebuild the model again. When I use my plugin, it rebuilds but the result is not as intended. It looks like it is rebuilding just one time. And updating the same result every time. Can't help you without looking into the code or a small project demonstrating the problem. If the code is correct, I suppose such a scenario should work fine.